Mary Vingoe’s 2013 play Refuge is a well-intentioned but not fully dramatic work about the plight of refugees to Canada under the Stephen Harper government. 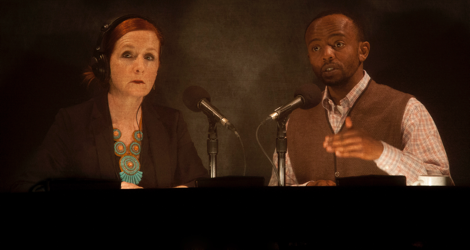 It is inspired by the award-winning CBC Radio documentary Habtom’s Path from 2010 by Mary Lynk that focussed on an Eritrean refugee claimant who committed suicide. Vingoe’s play alternates between verbatim text from the CBC Radio interviews and her her own fictional imagining of the conversations of those involved with the refugee claimant. It is not too surprising that the interviews are far more engaging than the fictional dialogues between figures who are less fully realized characters and more mouthpieces for various points of view or types of information that Vingoe wants to convey. Mary Lynk’s documentary is made up of interviews with people who knew Habtom Kibreab, a client of the Halifax Refugee Clinic. Following a negative decision on his case and facing deportation to torture and death in Eritrea, he took his own life in February of 2010. Universally praised as a kind, generous and hardworking man, Habtom had fled to Canada to seek refuge and build a new life. In Vingoe’s play, Eritrean army deserter Ayinom Zerisenai (who never appears) has landed in Nova Scotia, where his mother already has refugee status. Pamela Ross (Pamela Mala Sinha), who teaches English to Ayinom’s mother Amleset (Andrea Davis), learns of Ayinom’s plight. This she brings to the attention of the lawyer Saul Ackerman (Jason Weinberg), with whom she had once has a relationship before her father broke it up. Saul is reluctant but after Pamela pleads with him to remember his crusading past, he gives in. After much difficulty Saul manages to have Ayinom released from detention and suggests that Pamela take him in. Now it is Pamela who is reluctant and soon her artist husband Allan is spouting his fears that their new lodger may be a terrorist. The play might work if Vingoe were able to make the 180° attitude changes of three main characters believable, but she does not. In one scene Saul takes on Ayinom’s case very reluctantly. In the next he’s suddenly a born-again activist spouting facts and figures in a critique of the Immigration and Refugee Board of Canada. This doesn’t make much sense when Saul admits later on that there is no sure way of knowing anything about the backgrounds of refugee claimants from certain countries like Eritrea because there are no reliable records. Pamela is the one to urge Saul to take on Ayinom’s case, but when he asks her to let Ayinom stay in her house, she suddenly balks at the notion. Vingoe wants this to show that people who think they are liberal may still harbour xenophobia. In the play, however, Pamela’s resistance clashes with her demonstrable care for Ayinom’s mother, and since Vingoe does nothing to prepare us for Pamela’s turnabout, it looks more like Pamela simply doesn’t want her home routine disturbed than latent xenophobia. Least believable is Allan’s change from an easy-going artist to a rabid paranoiac. We can all understand why having a stranger living in your home might be uncomfortable. But Vingoe’s making Allan leap from this to assuming Ayinom is a terrorist simply makes Allan look like a fool. Allan fears what he sees in Ayinom’s diary, yet he does not read Tigrinya or even know its writing system. He gives ominous meaning to an extension cord in Ayinom’s room with its plug cut off without finding out why Ayinom cut it. He assails Saul with questions about Ayinom’s background knowing that the lawyer for legal reasons cannot answer. Vingoe wants this to demonstrate the mounting fear of the Other in an ordinary man, but it is so rapid and forced it looks more a mental breakdown and, worse, like an outlet for Allan’s jealousy of Saul’s prior relationship with Pamela. Vingoe’s technique of alternating the radio interviews with her fictional portrayals means the the play becomes extremely repetitive. We hear about every event in Ayinom/Habtom’s life at least twice or more. We lose count of how many times Ayinom/Habtom is called “gentle and soft-spoken” by everyone in the play as if they did not have individual ways of expressing themselves. We lose count of how many times people explain how difficult it was for Ayinom/Habtom to make his way to Canada. With other characters like Pamela, Vingoe repeats rather than develops ideas. We hear over and over that Pamela’s grandparents died in the Air India bombing by Sikh extremists in 1985 and that Saul defended Sikh asylum seekers in 1987, but the point of this is never clear. Vingoe has Saul tell Allan, quite unhelpfully, that we can never know for sure whether an refugee is or is not a terrorist. Vingoe might have added that we also cannot tell for certain whether any Canadian will or will not commit a crime. 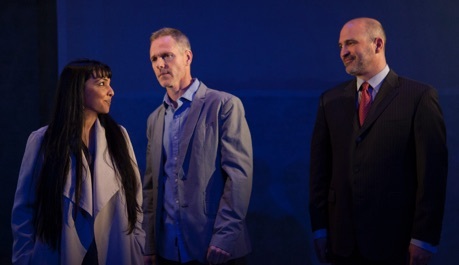 The little humour there is in the play, intentional or not, comes in Vingoe’s imitation of the CBC. Mary Francis Moore get exactly the tone of studied concern that makes CBC interviewers sound so alike. The fact that Moore’s interviewer uses the same tone toward her subject as she does towards the sound man about being recorded provides a nice satire on the numbing faux-earnestness of national radio. All the actors give fine performances considering the oversimplified characters they are given. The most moving performance comes from Raïs Muoi as Mebrahtu, the man who was Ayinom’s translator. One reason for this is that Muoi appears almost exclusively in the verbatim sections of the play. The simplicity and directness of his manner of expression barely conceal the pain he feels at having lost a brother Eritrean. Andrea Davis also gives a sensitive performance as Ayinom’s mother, who appears rather too seldom in the drama. Given that Pamela and Allan are troubled by Ayinom’s incommunicativeness, it would have made sense for Vingoe to have a scene where they ask Amleset how best to engage he son. Pamela Mala Sinha does make her character believable mostly because she doesn’t convey the latent xenophobia Vingoe wants from the character. Instead, Sinha shows that Pamela moves without respite from one set of worries (about Ayinom) to another (about Allan) and is worn down by them. Ryan Hollyman and Jason Weinberg use different strategies to glide over their characters’ inconsistencies. Hollyman’s technique is to gradually increase Allan’s intensity until it bursts out in his meeting with Saul. Vingoe gives him very little to work with and it is hard for Allan’s obsession with an extension cord not to appear comic. Weinberg, in contrast, uses an understated approach, which is just as well since Vingoe makes Saul the main conduit for information about the difficulties of refugees entering Canada and the arbitrariness of the refugee assessment system in the wake of the Canadian Anti-Terrorism Act of 2001. Director Kelly Thornton’s production is very stylish using three screens as walls and minimal props. This allows changes of mood to be created by Rebecca Picherack’s dramatic lighting, Richard Feren’s atmospheric sound and Kaitlyn Hickey’s projections. These last, often involving crashing waves on the high seas provide more energy and excitement than the play itself. Ultimately, Vingoe’s fictitious story is far too schematic to have any impact, unlike her recreations of the radio interviews. By the end, one wonders whether simply recreating Mary Lynk’s documentary live would not actually have more power than the fact/fiction hybrid of the play. Photos: (from top) Mary Francis Moore and Raïs Muoi; Pamela Mala Sinha, Ryan Hollyman and Jason Weinberg. ©2016 John_Lauener.